"Scottish Chieftain" redirects here. For the racehorse, see Scottish Chieftain (horse). Historically the principal function of the chief was to lead his clan in battle on land and sea. The chief and the chieftain were at one time in the Scottish Highlands influential political characters, who wielded a large and often arbitrary authority. However, none of this authority now remains. Highland chiefship or chieftainship in the modern sense is no more than a high social dignity. The existence of chiefship and chieftainship has been recognized by Scottish law; however, the disarming of the Highland clans after the 1745 Jacobite rising effectively eliminated clanship from ordinary civil or statutory law. Most notable was the Heritable Jurisdictions (Scotland) Act, of 1746 that abolished traditional rights of jurisdiction afforded to Scottish clan chiefs. While Scottish law recognizes the existence of clans, chiefs and chieftains, this recognition is only one of social dignity or precedence via the Lyon Court, and does not involve any interest for which the law has jurisdiction. According to former Lord Lyon Sir Thomas Innes of Learney, a clan is a community that is distinguished by heraldry and recognised by the sovereign. Without that recognition a clan chief, and therefore the clan, would have no official recognition. Innes further considered clans to be a "noble incorporation" because the arms borne by a clan chief are granted or otherwise recognised by the Lord Lyon as an officer of the Crown, thus conferring royal recognition of and on the entire clan. Clans with recognised chiefs are therefore considered a noble community under Scots law. A group without a chief recognised by the sovereign through the Lord Lyon has no official standing under Scottish law. Claimants to the title of chief are expected to be recognised by the Lord Lyon as the rightful heir to the undifferenced arms of the ancestor of the clan of which the claimant seeks to be recognized as chief. A chief of a clan is the only person who is entitled to bear the undifferenced arms of the ancestral founder of the clan. The clan is considered to be the chief's heritable estate and the chief's Seal of Arms is the seal of the clan as a "noble corporation". Therefore, under Scots law, the chief is recognised as the head of the clan and therefore, once recognised, serves as the lawful representative of the clan community worldwide. The Lyon Court remains the only authority which can make a recording of the dignity of a chiefship acknowledged by attestation, although it is suggested it cannot declare judicially a chiefship. Further, although no Scottish court can exercise a jurisdiction to determine disputes of competing claimants to a chiefship or chieftainship, to quote Lord Aitchinson in the Court of Session it is presumed that "Historically the idea of a chief or chieftain submitting his dignity to the arbitrament of its Court of law is really grotesque. The chief was the law, and his authority was derived from his own people". A number of constitutional changes took place with the Scotland Act 1998. Schedule 5 of the Act makes clear that certain matters are reserved, among others "honours and dignities or the functions of the Lord Lyon King of Arms so far as relating to the granting of arms"; but that is not the case for "Lord Lyon King of Arms in his judicial capacity", which is therefore subject to the powers of the Scottish Parliament. However, passed in the year 2000, The Abolition of Feudal Tenure Act of 2000 (2000 asp 5) explicitly states (sec. 62) that "Nothing in this Act shall be taken to supersede or impair the jurisdiction or prerogative of the Lord Lyon King of Arms," which suggests that the legal authority of the Lyon Court remains intact in all matters heraldic. To summarise, it is protocol and a preference for any Scottish clan to have their chief recognised by the Lord Lyon and therefore have legal status for the clan as a whole in Scotland and beyond, allowing their head to take their rightful place in the Standing Council of Scottish Chiefs. The Lyon Court, whose jurisdiction is heraldic, can confirm an application for the Chief of the Name and Arms of a Scottish family. However, the "Chief of the Name and Arms" is a heraldic term, originating from the French "chef du nom et des armes" and refers to the head of a heraldic armigerous family. There is no evidence of any practice that would point to the use of chief of clan, or chieftain of branch of clan, as correct heraldic descriptions of headship of an armigerous family. The term chief of clan and principals of branches is not to persons bearing coats of arms; chiefship and chieftainship have no armorial significance. [Note 1] Although the chief of clan and Chief of the Name and Arms may concur in the same person they are not the same term. See Chiefs of Clan Fraser for an example of chief of clan and Chief of the Name and Arms not being held by the same person. 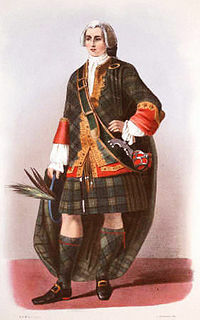 In cases where a clan has no chief, or a family wishes to have recognition as a clan, clan or family members can formally get together, witnessed by a representative of the Lord Lyon, in a derbhfine and appoint either a clan chief if the evidence of links to a chiefly line exists or otherwise a clan commander. The Lyon Court can recognize the appointment of a clan commander, for an interim period of up to ten years, whereupon a further derbhfine will be required. It is at this point that the Clan Chief is recognised by the Lyon Court. Clans with clan commanders are still referred to as armigerous clans. Clan chiefs are entitled to supporters on their coat of arms to specify a very high dignity. A requirement of the Standing Council of Scottish Chiefs for membership, is that an applicant chief must demonstrate a right to hereditary supporters. A chief without supporters could only be allowed to serve on the Council for their lifetime, and each successive heir would have to be re-elected in the same manner. The sash, as worn by Scottish women as part of the national dress, is normally worn over the right shoulder; only the wives of chiefs and chieftains, and women who are chiefs or chieftains in their own right, wear it over the left shoulder. For the correct way to address a Scottish clan chief, see Forms of address in the United Kingdom § Chiefs, chieftains and lairds. ^ Agnew of Lochnaw, Crispin. "Clans, Families and Septs". www.electricscotland.com. Retrieved 26 February 2008. ^ "What is a clan?". Court of the Lord Lyon. Archived from the original on 17 January 2008. Retrieved 26 February 2008. ^ The Scottish Clans and Their Tartans (1958), W & A.K. Johnson, p. 14. Mark, Colin (2003). The Gaelic-English Dictionary: Am Faclair Gàidhlig-Beurla. Routledge. ISBN 0-415-29760-5.
l'Académie Française (1843). Dictionnaire de l'Académie française (in French). Tome Premier (6th ed.). France: Firmin Didot frères. Gloag and Candlish Henderson (1987). Introduction to the Law of Scotland (9th ed.). Edinburgh: W. Green.